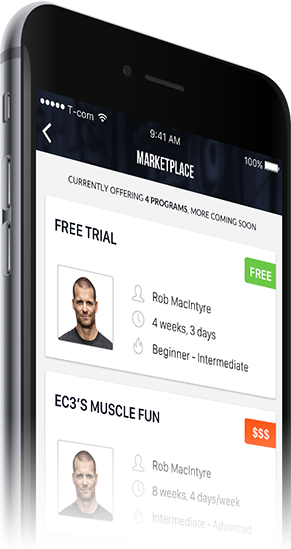 Browse through and access professionally crafted exercise programs for the first time ever via the Mogy mobile marketplace! On the mobile app, tap "Need account?" 1. Do I need a trainer to use Mogy marketplace workout programs? No. The marketplace allows you to use Mogy without hiring a personal trainer. You still get the benefits of the mogy app such as exercise videos and data collection. 2. How are the workouts on the Mogy marketplace created? The workouts are each created by top trainers carefully selected for inclusion in the marketplace. This way each workout has a personalized feel. 3. Can I see it in action before I actually buy a program? No problem. You can try a Mogy program by downloading the free 1-week workout to see it in action before you buy it. 4. I have never been to the gym. Is this enough to get me started? We always encourage novice gym goers to have some kind of guidance on basic movement skills for some of the standard exercises but certainly one of the beginner programs will point you in the right direction in terms of organizing your training. All the exercises are accompanied by video examples so you can always check on your technique. 5. How can I be sure I will get results from a Mogy workout? You can’t. The same way you can’t guarantee knowledge from reading a book. You only get out what you put in. Results are about YOUR effort in and out of the gym. However, you can rest assured that the workouts in the marketplace are created by trainers with years of expertise in helping people achieve their physique and athletic goals. They aren’t computer generated workouts or cut out of a magazine. They were created with the end goal of being efficient and effective. 6. Why are there so few trainers and programs in the marketplace? Two reasons. 1. The Marketplace is new so we are expanding slowly. 2. The purpose of the marketplace isn’t to have endless thousands of workouts. The goals is quality. This is why we only choose a few trainers to create workouts for the marketplace. 7. How do I know which workout is right for me? Each workout has an experience level suggested in the description as well as exercises used in the workout. Additionally you will find a video introduction from the trainer that created the workout that will explain in more detail what is expected out of you. Still have questions or suggestions related to anything Mogy?